18 months & up. 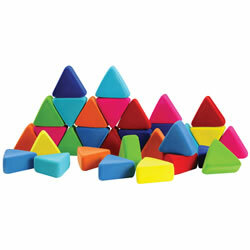 Inspire creativity in children with this set of very simple triangle shaped blocks. 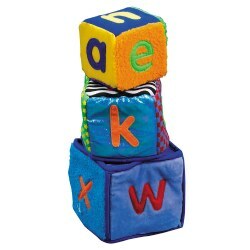 The colorful blocks with a soft and velvety texture are easy for the smallest child to hold. 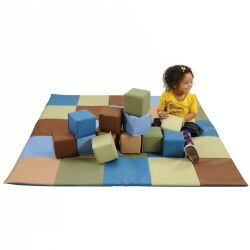 The simple design and open ended play teaches spatial and cognitive development through imaginative play. 18 months & up. 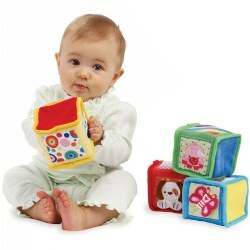 Clemmy® Plus is especially designed for children from 18 to 36 months. 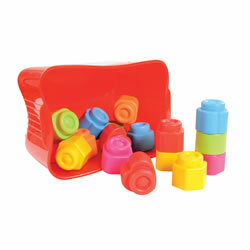 They are brightly colored and perfectly safe, thanks to the special soft material. 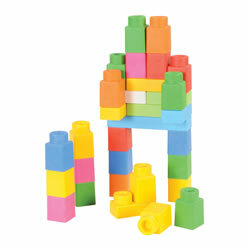 Clemmy® gets better and better as you fit the bricks together. 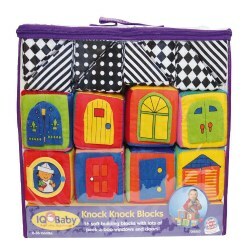 Ideal to stimulate imagination, creativity and role playing. 60 pieces. 2 years & up. All Aboard! 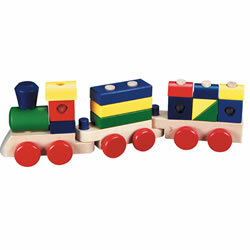 This little engine will have children on track for learning! Just a little imagination and they can custom build their own train from the 15 interchangeable pieces and three linking cars with sturdy pegs for joining cars and stacking "cargo" blocks. 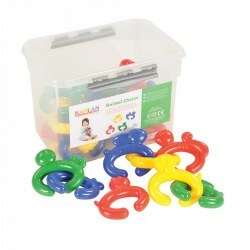 A must for any toddler as it encourages the development of color, shape and size recognition, spatial concepts, fine motor and problem solving skills. 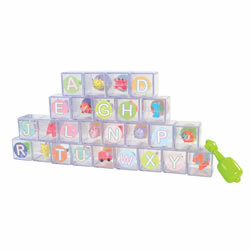 Measures approximately 17" x 6" x 3". 18 months & up. 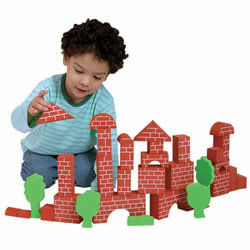 Add interest to block play with these brick-like designed blocks. 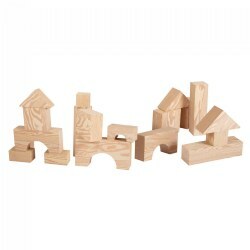 Add animals or other props to build a city, zoo, farm or just stack and knock down. 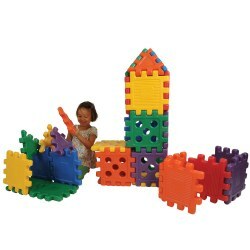 Includes soft foam trees and bushes. Bricks are 1 3/8" thick. 36 piece set. Birth & up. 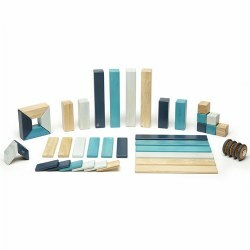 This soft, natural-toned set of 15 blocks is made of easy-to-clean polyurethane material. 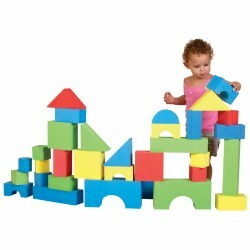 Blocks measure 5 1/2"H x 5 1/2"W x 5 1/2"D.
2 years & up. 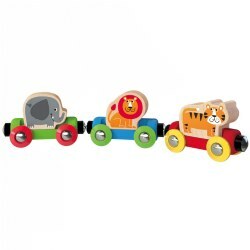 Enjoy a simple railway experience with these 3 friendly jungle friends. Use alone or as a train set add-on. Compatible with other train sets. 2 years & up. 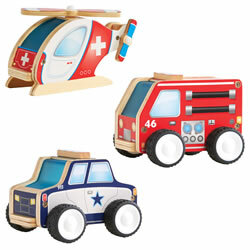 Sized right for toddlers, this set of themed vehicles feature sturdy plywood construction and frosted acrylic windows. 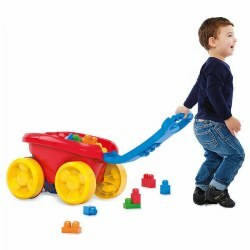 Realistic details and wide, soft plastic wheels make this a classroom favorite for block and role-play activities. Vehicles measure approximately 3 3/4"W x 2 1/2"-3 1/2"H x 5"D.
1 year & up. 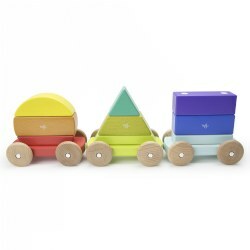 Create a magical Magnetic Shape Train with colorful train cars and mix and match magnetized pieces. 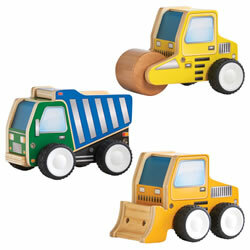 Make a circle car, a triangle car, and a square car or mix and match the pieces to form new and exciting shapes. Each car has magnetized ends so the cars can connect and roll together. 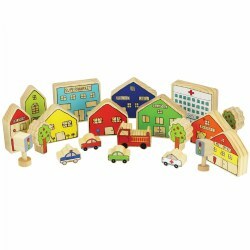 Included:8 Wooden, magnetized pieces in a variety of colors and sizes. 12 months & up. 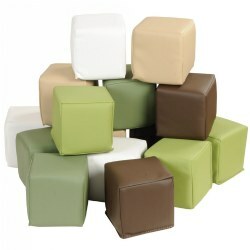 Thirty-two oversized soft foam blocks in assorted colors and shapes. Sizes range between 2 3/4" x 2 3/4" to 2 3/4" x 11 1/2". 12 months & up. This set includes seven animals with smooth textures and bold engaging colors. 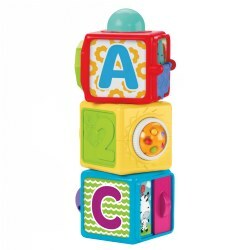 Set includes: giraffe, whale, peacock, tiger, bear, panda bear, and elephant. 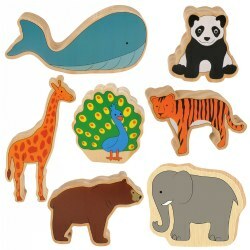 Animal figures are 1.18" thick and are double-sided. The giraffe is 5.7" x 3.4".